Italian misery-mongers Forgotten Tomb having been ploughing the field of human sorrow for over ten years now, and sixth full-length ...And Don't Deliver Us From Evil is the largest step taken away from black metal in their career yet. Something like an Italian Shining in many ways, Forgotten Tomb have never really appealed to me in the past due to the sheer extremity of their suicidal desires, manifested in not-always-interesting depressive black metal. Opening track Deprived, however, kicks off with pure black n'roll groovy downtuned riffs and is similar enough to recent Shining for fans of that to get into this very easily. Like Shining, Forgotten Tomb break up periods of darkness with lighter moments, in this track choosing a proggy, almost pastoral moment of gothic introspection before launching back into the cathartic gloom. And it's pretty good, all things considered. The guitarwork is varied, complex and catchy at once, the songwriting expert and more than capable of holding your attention. Black metal elements are still present and correct, the dripping horror of the blastbeat-fuelled darkness that opens the title track very effective. It's certainly more inclined that way than recent Shining, having the dark atmospheric presence of the best black metal, even as the instruments may seem to play a different style. Doom, goth, and even melodic death metal make appearances, but their purpose is fashioned around the all-encompassing bleakness of the band's message, and so fits thematically. That doomy, miserable vibe holds the music together, which really is quite hard to pigeonhole - this is quite a genre-bender, and that Forgotten Tomb make it work so well is a massive mark in their favour. Whether it's the slow, intense bleakness of Cold Summer or the upbeat, bassy rocking of Let's Torture Each Other there's an equally hateful tone, and even Love Me Like You'd Love The Death's extended melodic soloing has a gloomy air to it, an interlude before the self-harm resumes. The hints of Katatonia-esque gloom rock of Adrift and the raging black metal of Nullifying Tomorrow are just further shades of grey on the band's artistic palette, and the portrait painted a compelling one. 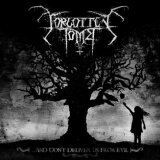 Far from the slightly ridiculous image, Forgotten Tomb are a very interesting band. It's harder to detect the tongue-in-cheek here than it is with, say, Type O Negative, but the best gothic music has always been enhanced by the po-faced seriousness it deals with its gloominess, and that Forgotten Tomb go even further with the self-hatred and suicidal desires doesn't lessen this effect - it increases it. Few bands can write music that haunts you one moment and makes you giggle the next, but Forgotten Tomb manage it here on a solid album that suggests Kvarforth and co had better start to cut that bit deeper if they want to be the best purveyors of blackened misery on the scene.